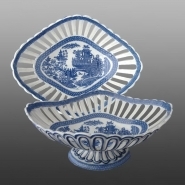 Shown here is a pierced earthenware fruit basket printed in the Turner Elephant pattern. An oval shaped earthenware platter printed in blue with the Elephant pattern. The TURNER mark includes the impressed Prince of Wales Feather mark. It is thought that Turner had planned to produce a series of designs using different animals, but this pattern is the only one known. For more on this early elephant pattern, see the Northern Ceramic Society Journal pages 97-136, Vol. 29, 2013 for an article 'Animals on Printed Pots: Understanding the Role Animals Played in Early British Wares c.1790-1820' by Loren L. Zeller.